Note to Arsenal - no diving, no stamping, no spitting and no hoodies. Ouch. Even writing the scoreline is like a dagger through the heart. This was not an unexpected defeat but it was a cruel one nevertheless. It leaves City essentially four points adrift from safety but hopefully with a welcome injection of confidence that has ebbed away after successive spankings at West Ham and Everton. City reverted to the 4-4-2 system which has served them well in home games, but early on looked stretched in the middle with Craig Fagan and Dean Marney on the wings rarely getting involved in play. In fact we looked overwhelmed in midfield and unable to close them down quickly enough, leaving Andrei Arshavin loose to fire the Gooners into an early lead. It was looking like a real hiding was in the offing, but against the grain Marney looped a superb ball over the Gooners’ defence for Jan Vennegoor of Hesselink. He had the simplest of chances six yards out but Sol Campbell dragged him to the floor before he could shoot. Referee Andre Marinner couldn’t avoid awarding a penalty but unfathomably bottled sending off the former Notts County player. Jimmy Bullard tucked the spot kick into the top corner to make it 1-1 and the equaliser instilled belief in the players and the fans that we could take a point or three from this game. That optimism remained right until the referee located his red card and sent off George Boateng – rightly so by all accounts – and we were down to 10 men from the 44th minute to the 100th. Early in the half, another City disaster as Kamil Zayatte was worryingly stretchered off, adding to our selection problems at centre-back, though Liam Cooper is fit again to stop us needing to recall Ibrahima Sonko or playing Zinedine Kilbane out of position (though what his proper position is, I haven’t a clue). A combination of comedic Arsenal shooting and stout City defending prevented the visitors from even having a second half shot on target until the 89th minute, though several ballooned 80 yards over the bar. One from Arshavin is believed to still be in orbit. There followed the board going up to indicate six minutes of injury time, two minutes into which a desperate long-range Arsenal effort was feebly patted down by Boaz Myhil and their striker made no mistake from the open goal. Added to the own goal winner he scored for Blackburn Rovers , the very saveable two goals that went past him against Bolton, and the bad mistake which led to Everton’s crucial third goal last week, it’s not been an impressive few months for Bo since he salvaged a point at Spurs with a heroic performance. On the way home, I heard various Arsenal fans label City a dirty side and part of the conspiracy that’s out to injure all their players. But aside from Boateng’s recklessness, I didn’t see any evidence of that – in fact the horrible challenge that saw Zayatte leave on a stretcher was the only one that had me wincing. Remember that, in the league table of the Premier League teams who are fouled the most, Arsenal are apparently only second – it’s Hull City who are on the receiving end more than anyone. Listening to the radio, Arsene Wenger had amazingly actually seen the penalty incident and gave a fair and honest assessment of his initial reaction and then how this had changed upon watching replays. Shame the travelling Arsenal fans – who took a collective vow of silence from the moment our equaliser went in until their last-gasp winner – couldn’t show as much class as their manager, as they cheered and waved goodbye to Zayatte as he was carried off. City fans, who earlier had warmly applauded a Gooner song about Aaron Ramsey, retaliated to their heartlessness with a rendition of ‘There’s only one Ryan Shawcross’, the Stoke hothead who crocked Ramsey. It’s clear Arsenal fans want it both ways – they’re disgusted at anyone fouling one of their players, but when it happens to a player for another team they revel in it. For City, taking anything from this game was always a longshot. The real action now switches to Portsmouth next Saturday. Be there if you can. Due to the lack of Hull City action, I made the most of the football-free weekend and took a relaxing trip to the Lake District. Actually, it wasn’t totally lacking football as my debut visit to Ambleside took me to the Homes of Football gallery, which displays and sells stunning photographs taken by Stuart Roy Clarke. Even if you have not heard of him or the gallery, chances are you’ve seen some of his Hull City photos, such as the supporters’ club hut at Boothferry Park. Prints of about a dozen of Clarke’s Hull City photos are available at about £50 each, although each one is limited to 50 copies some others have sold out. You can order the prints online, but I would thoroughly recommend a visit to browse their bricks-and-mortar shop if you’re ever in the Lake District. in the downstairs gallery, I enjoyed reminiscing about the terraces and eccentric scenes from football before it was all-seater and sanitised – compare the beautifully atmospheric photos of the old grass bank behind the goal at Springfield Park, Wigan, for instance, with their new DW Stadium and weep. I also stumbled upon two great discoveries. 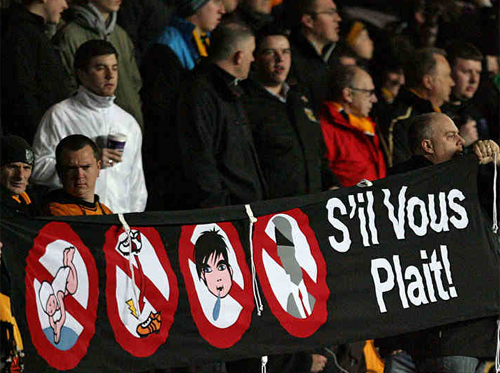 Firstly, there’s this six-foot papier mache Hull City figure, carrying a club holdall. I suspect it’s meant to be a coach or manager, but as it’s crudely fashioned I’m not sure who it is. Even so, it’s done in a charming way, and to be confronted with a Hull City statue made out of paper mache on the other side of the country is a great surprise. Secondly, their shop sells individually hand-painted Subbuteo figures made in the likeness of famous footballers. Stocks were low, but among the ten or so items still left on the shelf were these little fellas – one-inch high versions of Jimmy Bullard and Geovanni, complete with proper hair and skin tones, the right kit and the name and number on the back. They’re not bad likenesses, in my opinion, though Bullard would look more accurate with longer hair and a knee brace. That, I suspect, would involve more than paint. Making further enquiries online, it seems there’s a company, Shoot First, which specialises in painting and selling these Subbuteo players. And as well as famous stars, you can buy personalised figurines made depicting any other players – or even yourself. All for less than a tenner. Big hint for any non-football fans who happen to be reading this – getting your loved one immortalised as a Subbuteo figurine would be a flicking great present. NOTE: I’m not gaining financially from this post, I just like the stuff I’ve written about.